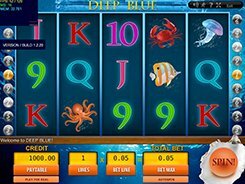 Deep Blue is a Gamescale-powered video slot with 5 reels and 9 paylines. Themed around sea, the slot features fish, octopuses, jellyfish, crabs and other underwater creatures as well as classic 9 – Ace playing cards. A player may change the number of active lines (1 to 9) and a line bet ($0.1 to $5), thus a total bet may vary from $0.9 to $45 per spin with all lines activated. Deep Blue has a fairly simple appeal and a somewhat basic set of features that make the game ideal for beginners. There is a wild symbol in the slot that helps complete winning combinations by replacing missing symbols. Besides, the wild (Dolphin) doubles payouts when used as a substitute. 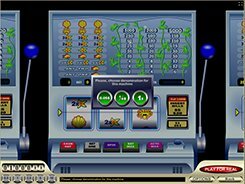 Hitting five Dolphins across an active line awards 9000 coins (or $45,000 on the max bet) which is the biggest prize you can win spinning the reels in Deep Blue. The game also features a free spins round triggered by three or more scatter symbols depicted by the Mermaid. Should this happen, you get 15 free spins with all wins tripled during the feature. Five scatters occurred in any place award a win of your total bet times x500, so playing the maximum $45 stake you may grab $22,500 on that combination. PLAY FOR REAL MONEY!